PPC is a service that can be enabled for LMS directory listings. Why use eLearning Industry’s PPC Service to promote your LMS? Our PPC service will immediately drive traffic to your site, while other marketing efforts may require some time to pay off. When you enable PPC for your LMS directory listing, we send links back to a landing page of your choice. Additionally, we give you control over the position of your listing in the LMS directory. How do I enable PPC for my LMS listing? First, create and submit an LMS directory listing, if you don’t have one already. As soon as your listing is published, you will be able to log into your account and set up a PPC campaign for it. Need help to start with PPC? You can have an account manager walk you through the process. The bid is the amount of money you are willing to pay for each click you get to your site. Setting a bid for your PPC campaign is required. The minimum allowed bid is $0.50 per click and can be adjusted in steps of $0.25. Adjusting your bid directly affects the position of your listing, and bidding higher will grant you a better position. Note: If you bid the exact same amount as another competitor, the one with the biggest monthly budget will be displayed first on the list. Location-based bidding gives you more control on how your money is spent and gets you maximum value out of your PPC campaign. This is the simplest option from your end. You set up a single bid for your LMS directory listing and we will use it for all visitors from any country. In this case, PPC is enabled for all visitors, regardless of the country they are browsing from. This bidding strategy is best suited when you really want to "test the waters", start getting some initial traction, and see how the eLearning Industry PPC service works for you. This is the most straightforward option: You select only the countries you want to target and set a bid for each of them. In this case, PPC for your directory listing is enabled only for visitors browsing from the countries you’ve set a bid for. This is the most advanced and recommended bidding strategy. Using this option, you set a default bid for all countries, along with individual bids for a set of countries that may be of special interest to you. In this case, PPC for your directory listing is enabled for all visitors, but a) your listing is positioned and b) clicks are charged depending on the bid you’ve set for the country the visitor is browsing from. The monthly budget is the amount of money you are willing to spend on clicks during the period of one calendar month. Setting a budget for your PPC campaign is required. The minimum budget allowed is $250 per month and can be adjusted in steps of $1. Note: We will never exceed your allocated budget. The target URL is the address of the landing page that users will be redirected to when they click on your directory listing. Setting a target URL for your PPC campaign is required. You have the option to track the conversions from the traffic you’re getting from the directory. In order for our system to track conversions, you must install the appropriate conversion tracking code in the page that your visitors will see right after the action you want them to take. That may be a subscription Thank You page, a contact form success page, etc. Conversions are reflected in your campaign reports and complete the picture of your campaign’s performance. When your directory listing is published, a PPC campaign is automatically generated for you so you can start setting it up. Directory listings with PPC campaigns pending setup are ranked according to the general directory ranking principles and do not include links to your website. After you setup your campaign, you can Start it. Directory visitors will see your listing in the position that reflects your bid, and links to your target URL will also be displayed. When you spend 100% of your budget, we change your campaign status to capped. Directory listings with capped PPC campaigns are ranked according to the general directory ranking principles and do not include links to your website. This is a temporary state which is reset automatically on the first day of each month. In order to get your PPC campaign up and running immediately, you can increase your monthly budget and restart it. After the end of each month, we will issue an invoice for the clicks you've received and automatically attempt to charge your credit card for it. If charging your credit card fails for three consecutive times, your campaigns will be marked as suspended and you will not be able to run your campaigns until the invoice is fully paid. Directory listings with suspended PPC campaigns are ranked according to the general directory ranking principles and do not include links to your website. You can stop a running or capped PPC campaign at any time. Directory listings with stopped PPC campaigns are ranked according to the general directory ranking principles and do not include links to your website. You will still be charged for any clicks delivered until your campaign was stopped. We will try to keep you as best informed as possible so that your campaigns run smoothly, delivering maximum value for the money you spend. We will notify you via email when you reach 80% of your monthly budget. We will send you one more when you reach 100% of your budget and your campaign's status will change to capped. What you can do after is change that month's budget so that the campaign can resume, or wait for the new month for the campaign to resume. We will notify you on the beginning of every month, when your payment is completed. Otherwise, you will receive 3 notifications in total asking you to change your card or add more to its balance. There will be times that clicks appearing on our platform will be more or less than your Google Analytics reports. We charge (and report) unique daily clicks. Therefore, if someone clicks on the listing five times within a day in 30-minute intervals, we will report one click, but your Analytics will report 5 sessions. We are also adding UTM tags so you are able to track the traffic we bring to your website inside your Analytics. Those UTM tags appear on the URL of your website's landing page. If this URL is shared with other people, it will appear as additional traffic on Analytics, but won't appear nor get charged on our platform. There's also a small chance that after a visitor clicks on your listing button to get redirected to your website, they will close the browser tab before the page fully loads. This might lead to a lost visit on Analytics. Generally speaking, clicks on your analytics should be more than the clicks reported on our platform. There might be times when someone will click your PPC listing multiple times within a day. In order to avoid this sort of abuse, we only charge you for the first time the user clicks in a 24-hour period. Aim for the front-page position and gradually adjust your bid, always keeping in mind to bid what makes sense to your business model. Bidding enough to be on the front-page is essential in the beginning. It will help you get fast exposure and be able to evaluate the directory's quality of traffic. Check the individual country targeting tabs at least once a week to stay up to date with what your competition is bidding. How is my listing position calculated? Bidding for a given position is a complex task, but we've done our best to make it as straightforward as possible. When you change your bid, the preview is instantly updated so you can immediately understand how the change will really affect your position. If the preview shows you a range of positions, it is a sign that one or more of your competitors have placed the same bid for the same country and your final position will depend on your budget. 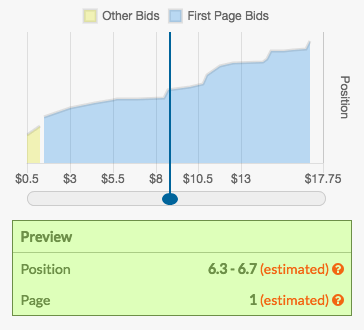 Note: When you are adjusting a global bid, the preview shows you an estimate of your average position. Your actual position may vary depending on each visitor's country. Can you guarantee my position? Your position depends on your and your competitors’ bids and budgets. We cannot guarantee your position, but we do allow you to adjust your bid and budget as often as you like in order to achieve the position of your choice. Can you guarantee my budget will not be exceeded? Yes! We will never exceed your allocated budget. After the end of each month, we will issue for the clicks you've received and automatically attempt to charge your credit card for it. Can I stop using the service? Yes! You can stop your PPC campaign at any time. Your directory listing will still be available, but it will be placed below PPC-enabled campaigns and it won’t include links to your website.